The 1911 furniture workers strike in Grand Rapids was/is critical to our understanding of both the power of organized labor in this community and the ruthlessness of the capitalist class. We have written several pieces about the 1911 furniture workers strike, with this overview article containing most of the posts you will find on this site. We are excited to present this new print by artist and GVSU professor Brett Colley, a print that celebrates the 1911 furniture workers strike. 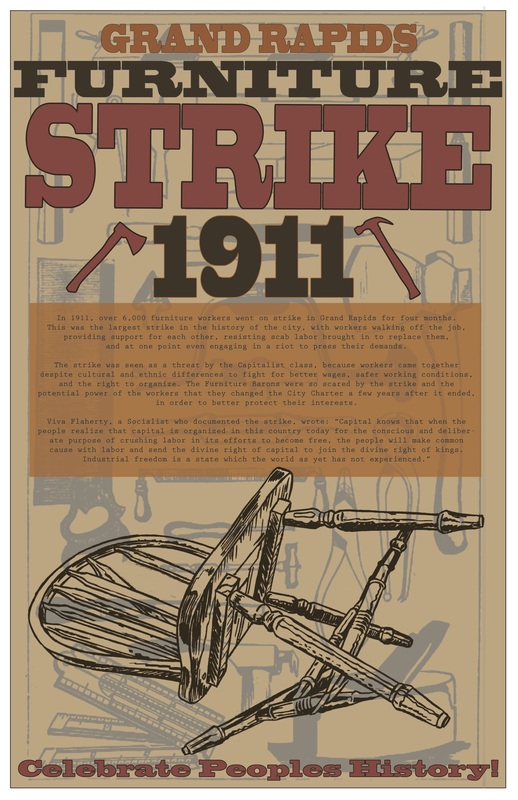 The print not only visually captures the spirit of the 1911 strike, it provides a written summary of the importance of the strike, it provides a brief analysis of the push back from the furniture barons, along with an excerpt from the most vivid documentation of the strike. Viva Flaherty, a socialist, who worked at the Fountain Street Church, documented the 1911 strike and provided astute analysis of what went down. You can read the 30 page report that Flaherty produced about the strike, but the essence of what she wrote is captured in this new print. This entry was posted in Anti-Capitalism/Labor, People's History Artwork and tagged 1911 furniture workers strike, Brett Colley, Grand Rapids furniture barons, Viva Flaherty. Bookmark the permalink.